To be in a show"
Broadway composer/lyricist Stephen Sondheim has had a long and distinguished career challenging the accepted conventions of musical theatre with such works as Sweeney Todd, Sunday in the Park with George and Company. One of his less successful efforts, Follies, opened in 1971 and closed shortly thereafter without yielding so much as an official cast album (though a later British production was recorded for posterity). 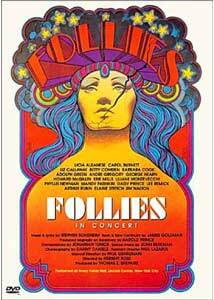 Follies in Concert documents the 1985 effort to rectify the situation, assembling a cast of Broadway luminaries at Lincoln Center, under the direction of Herbert Ross and Sondheim's frequent collaborator, musical director Paul Gemignani. This production presents the show's songs in concert format, with truncated dialogue excerpts and as much feeling as could be mustered during a compressed four-day rehearsal period. The all-star cast features Sondheim veterans Lee Remick, Mandy Patinkin, George Hearn and Elaine Stritch, with additional contributions from Carol Burnett, Barbara Cook, and longtime writing team Betty Comden and Adolph Green. Sondheim's Broadway songs are usually so intertwined with each show's subject matter that they cannot be extracted and performed outside the original context, but in this case the songs stand alone reasonably well. The tunes are intentionally old-fashioned, evoking the grandiloquent Ziegfeld era of the 1920s and 1930s, but the lyrics are pure Sondheim—introspective and eloquent, delineating intense pain and joy with a few telling details and rhymes that surprise and delight. Broadway Baby remains a classic (though oft-abused) interpretation of the plight of a struggling young actress, performed with irony and humor by Elaine Stritch; I'm Still Here presents the far end of the same journey, rendered by Carol Burnett with fiery defiance and sardonic wit. Mandy Patinkin whips himself into a Jolsonesque frenzy in Buddy's Blues, and Lee Remick struts and vamps her way through Story of Lucy and Jessie. Follies in Concert is a misleading title—half of the ninety-minute program is devoted to documentary footage of the rehearsal process, and many songs are truncated or omitted altogether in this filmed record. The low-budget, on-the-spot production suffers from some misframing here and there, and the concert audio is no replacement for the official cast album engineered by Thomas Z. Shepard. The documentary footage is valuable—it's wonderfully human and somehow reassuring to see veteran Broadway stars stumbling their way through lyrics and dance steps early in the process. Remarks by many of the participants (and Mr. Sondheim himself) enhance our understanding of the songs and the challenges posed by the production, and I don't mean to suggest that the program would be better off without this "behind the curtain" footage. I only wish the program could have been lengthened to include the landmark concert in its entirety—as it is, Follies in Concert fills in some gaps for Sondheim fans but may not appeal to the uninitiated. Image Transfer Review: Follies in Concert is presented in its original made-for-television 1.33:1 full-frame aspect ratio. The material appears to have been shot on grainy 16mm film (one of the cameras has distracting lens scratches) and edited on videotape, introducing additional image noise. Colors are overly subdued, shadow detail is poor, and fine details are blurry and smeary throughout. The image is watchable, but regrettably dated, and one wishes a direct film-to-DVD transfer had been possible. Audio Transfer Review: Image presents Follies in Concert in its original Dolby 2.0 Surround format (identified only as Stereo on the keepcase). The documentary footage is monaural, while the concert is presented in nicely-staged surround with substantial audience applause in the rears. There are a few presentation glitches—sound shifts to one side or the other on occasion, and the audio cuts off rather abruptly at the program's end. The documentary footage suffers significant background hiss and hum. Still, the challenges of recording a live stage performance are well-met here—it's no competition for the official cast album, but it sounds very good for a 1985 television production. Extras Review: No supplementary content graces the Follies disc, aside from 23 picture-menu chapter stops incorporated into the main menu, 16 of which double as song stops. The program itself contains substantial documentary content, but this is about as bare-bones as DVD gets. Follies in Concert, more documentary than concert film, covers the mounting of an all-star, one-time performance of Stephen Sondheim's 1971 box-office failure Follies at Lincoln Center. The program does a fine job of exploring the production and the performers involved, but it's really a companion piece to the official recording, recommended primarily for Broadway enthusiasts and Sondheim completists.